Hallmark Channel's first movie musical! A high school music teacher is crushed when the school board cuts funding to her after-school music program. To save the class, her former students plan a production of their old high school musical in hopes of raising the necessary funds. The reunion, however, uproots unsettled differences from the past, and the real question is will the cast be able to keep it together to make the show a success? 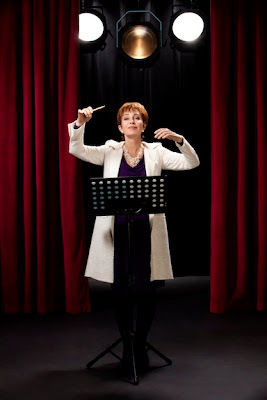 In "The Music Teacher," Annie Potts plays Alyson Daley, a high school music teacher who loses her beloved music program to district budget cuts. Alyson created the program to help her eager, ambitious and talented students excel professionally and losing it means the kids will not have musical performance as an avenue to a brighter future. On a personal level, her good friend Ray (Richard Thomas) and the music program have been Alyson's therapy to deal with the excruciating accidental deaths of her husband and son. Alyson Daley is devastated. Just when she thinks the dream is over, Alyson's former students reunite to put on a show-stopping musical to raise funds to keep the program - and everyone's dreams - alive. "The Music Teacher" will feature original songs and lyrics that are being composed specifically for the film by Alan Ett. I love Cedar Cove- have watched every episode so far!